Discussion in 'Food & Cooking' started by cape chef, Jan 25, 2010. Does it still exist? I believe it does. After chatting with a friend recently about this topic, and seeing the reply from petals on the thread about cooking a duck, it made me think it may be interesting to discuss ones favorite French recipes. The duck recipe from Chez Michel rings of classic technique, especially thickening the sauce with the liver. (the blood thickens). A few come to mind because of the season. I love everything about Choucroute Garni, from the cabbage to the Strasbourg sausage to the smoked pork.Of course a nice dry Alsatian Riesling goes perfect. Cassoulette, which was recently discussed is another favorite of mine from Gascony. It's the best of all worlds, pork, lamb, sausage, duck confit ( I know it depends on what neighborhood your from) to what you use, but that is what I use. Warm, rich, fragrant,& savory. A Fitou is my wine of choice. I enjoy a perfectly simple onion tarte from Provence, a buttery/tender pate brisse, a perfect custard and lots of soft caramelized onions. With a salad of mesclun (from Provence) and a glass or two of Tavel it's a satisfying lunch or light supper. I have many more I love, what about you? I picked up my first French cookbook recently, I Know How to Cook. I've been impressed with the other books in this line from Phaidon press. I've never been impressed with much of what I've encountered of French cooking and there's plenty in this book I've not liked too. But there's been enough that I have liked to pursue deeper than I have in the past. To me, much of French cuisine is overwrought or underwrought with little that meets my personal balance. If I had to categorize,I would say that the casual bistro style comes closest for me but I couldn't say if that's classic French cuisine. I look forward to more insight from better cooks than I am. ETA, for Phil: I forget where I read something about a French person (don't remember if it was a chef or someone else) saying how Americans complain that French food is all sauces obscuring the food, but then we pour ketchup over everything. Or mayonnaise, or mustard. Their is nothing like a great French Bistro, this is where you will find many of the classics that don't fit into the modern fold.Chef Philip Jeanty prepares the most satisfying oxtail terrine, with a touch of Pommery mustard, a cornichon or two and perfect croustades from a baguette. Suzanne, I love sole meunière as well as Homard in the Brittany style. Silky and spicy. I don't know if rilletes du porc or du canard qualify. Either one with a baguette and a glass of red wine and I'm good to go! I once made Tripes a la mode de Caen and liked it a lot. I used honeycomb tripe, which is milder in flavor. Wonderful texture! Sometimes I miss the simple things from my childhood. Good products were what made those simple ubiquitous sandwiches a great lunch. No fussy recipes there. Bread, bread, bread. . .
Red wines . . .
... don't get me started! Oh and rillettes of course!! Even rabbit rillettes are amazing!! You have a lot of experience with French cuisine. I see your a culinary student. Did you grow up in France? I was born and grew up in France, yes! I've cooked all my life. I recently decided to go back to (culinary) school (night classes, once a week) to get some solid foundations. Cut chicken breasts in bite size bits. Guests then dip in cream (not beaten eggs as many people think), then in bread crumb, and fry in oil pot. Obviously, the recipe is better with Poulet de Bresse and with "real" cream (as a wee boy I would go to the farm next door, have them fill our jugs with fresh milk (sometimes I had to go in the stable and wait as I watched the old woman milk the cows) and once home we'd just skim the cream from the surface). A unique prune cake - that one I've never made so I couldn't give you the recipe other than copying it from one of my books (let me know if interested). The taste and mouthfeel (real thick) is really unique, I can't think of anything close to it. I guess this word has several meanings. To me, in my childhood, quenelles were quite large, and "nature" (no fish, no poultry, only milk+butter+flour: it's surprising that you would use the same ingredients for the quenelle as for the sauce that accompanies them, but it works wonderfully). I couldn't find any online pic that looks anything close to my memory. I've tried to make my own once, but was only partially successful: the quenelles kinda fell apart once cooked, and almost dissolved into the tomato-béchamel. I will have to try again! Dans quelle région de la France avez-vous grandi ? Another dish I enjoy is brandade du Morue from Pays-Basque. Mezz, Rillette whether Lapin or Canard with a pinot noir is simple a peaceful way to enjoy some meat, fat and grape. pains au raisin....man I miss them, almost enough to make a batch. a couple of my dearest friends have comfortable French restaurants here....with another from Lyon openning a southern French place this summer. One's got cassolet on the menu now....the other has a frangipane apple tart who's glaze had just the nicest tartness to it. boudin...blanc and noir, especially cajun....which is sorta kinda french but far removed. croquant....my mom used to make burnt almond caramel when I was very young, we had an almond tree in the back lot. the list goes on and on.....and classic french has not disappeared. Where is one to start ? I agree with the posts above ...classic , I have a list of some things I miss and enjoy. Petals, I looked up garbure, and apparently it can vary a lot. How do you make it/like it? Far breton and clafoutis are different although similar I guess. I've had both, and they are both delicious! Clafoutis is typically made with cherries or "meurises" or "griottes" (that last one is probably the tastiest one!). Far is made with dried fruits, like prunes or, more rarely, raisins or a mix of both. It's a specialty of Brittany and is also completely browned on top. We just had ours a couple of week ago (it's only once a year!). It was great!! Thanks! I grew up in beautiful Grenoble, in the Dauphiné, land of gratin dauphinois. As for my instruction - it starts tomorrow night!! Kind of I guess, although I could never find any that look like the smaller ones we had in France. And the taste is nothing like what I had in France. Here's what it looks like, served with hod lardons (think little bits of sautéed bacon). French Fries: The dandilion greens you remember are a cultivated crop. 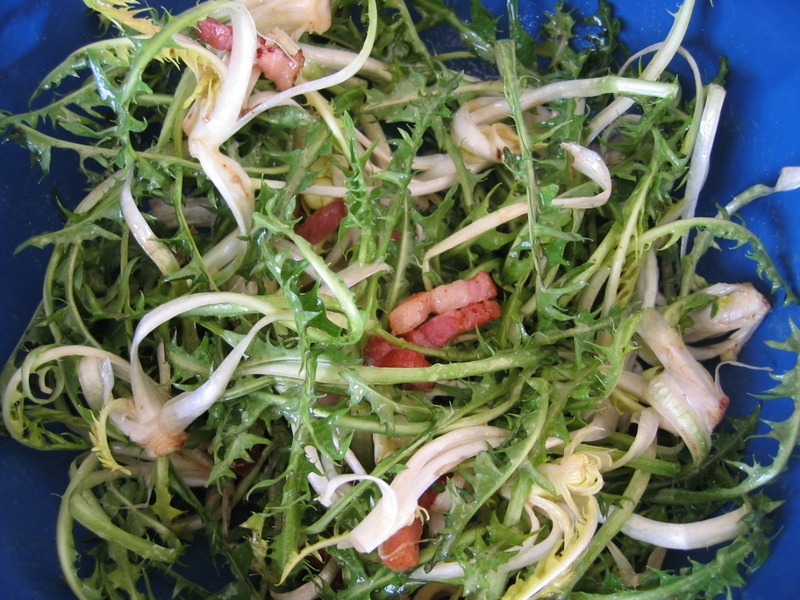 The French Dadilion leaves are thinner, longer, and slightly less bitter than wild American dandilion. Seed is available if you want to grow your own. I wish you only the very best in your new studies....you have passion, you WILL go far. A wonderful dish from the South of France , it has become very popular. Alot wonder what to call Garbure, is it a stew ? A soup ? I say it is a stew because it looks and tastes just like one only with a unique flavor. The original Garbure has goose wings, but I use chicken wings.